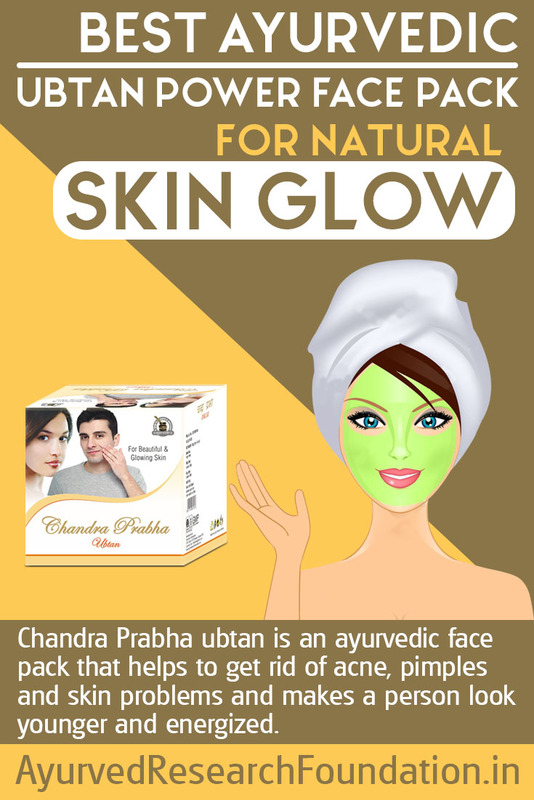 Chandra Prabha ubtan is an ayurvedic face pack that helps to get rid of acne, pimples and skin problems and makes a person look younger and energized. Chandra Prabha ubtan is herbal powder which provides magnificent ayurvedic face pack for cleansing skin and treating acne and pimples. Acne usually affect at young age but can occur at any age, these can be mild to severe and reoccur again and again. Regular occurrences of acne or pimples can make skin rough, dull and sick and may even make it spotted and form scars after healing. Chandra Prabha ubtan possess herbs which treat problems of acne and pimples from root, heal them faster and prevent their reoccurrences, these provide numerous other benefits to make person look younger and energized. This ayurvedic face pack possesses herbs which open-up blocked skin pores and allow sebum to flow out, blocked sebum when gets infected by bacteria forms pustule which becomes pimple, by allowing sebum to flow out smoothly this ayurvedic face pack minimizes chances of pimples and acne outbreak. By clearing blocked sebum this ayurvedic face pack heals existing pimples fast and safely without causing any mark or spot. On regular use this ayurvedic face pack keeps skin free of bacteria and also healthily hydrated and moisturized to prevent acne. This herbal facial mask stimulates growth of connective tissues and remove dead cells, it also speeds-up cell generation and keep skin fresh and young. Growth of connective tissues keep skin tight and lighten scars, higher connective tissues remove lines, wrinkles and keep skin youthfully smooth. 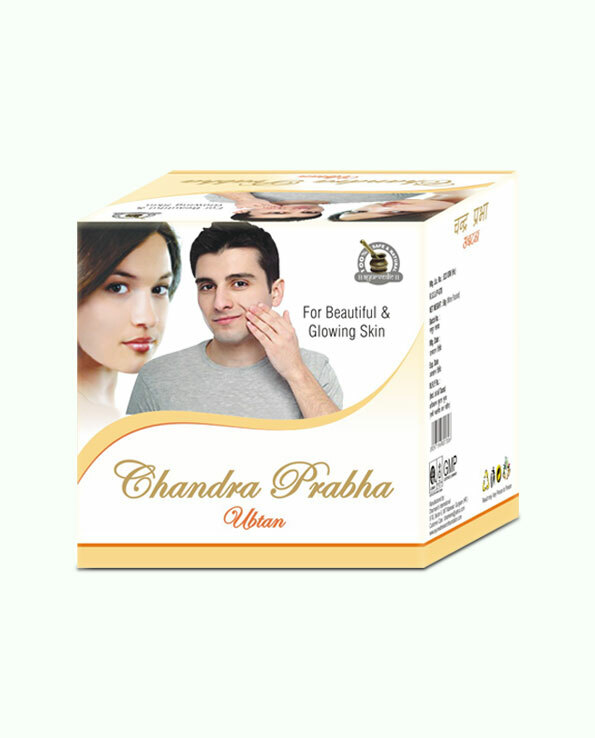 Chandra Prabha ubtan ayurvedic face pack by regenerating cells faster dissolves dark spots and marks on skin. This herbal facial mask replaces old skin cells containing higher melanin with fresh new ones to provide skin even tone and brighter shade. Apart from healing and preventing acne this Chandra Prabha ubtan ayurvedic face pack removes dark circles and rough patches over face. This herbal face pack for acne and pimples keeps skin soft and plump by maintaining its moisture and repel ill-effects of external stressors which strain skin regularly. This ayurvedic face pack suppresses signs of ageing, and shield ill-effects of cosmetic creams, air, water, environmental pollutants and chemicals present in soaps etc. This herbal face pack for acne and pimples curbs activities of toxins which affect skin from inside and make it dull. Poor diet lifestyle and bad habits like smoking, alcohol etc. can make skin dull by promoting toxins in blood. Chandra Prabha ubtan cleanses skin and keeps it fresh and younger looking by curbing internal and external stressors effectively. Is this face pack safe to use? Chandra Prabha ubtan is purely herbal and contains time-tested ingredients which provide safe and amazing results. It can be used regularly by men and women of all ages and without fearing about side effects. This face pack during production passes through strict quality checks which make it 100% safe. What are the ingredients of this face pack? Chandra Prabha ubtan possess herbs as ingredients which have been part of life of Asian women since ages for gaining timelessly beautiful and charming skin. No artificial substance or compound has been added and this powder comes in pure herbal form. If you want to treat acne and pimple add 3 to 5 grams of this powder to milk or curd to gain a paste, apply this paste rubbing skin gently and wash off with water after an hour. For gaining brighter and tighter skin mix similar quantity with rose water and follow the process. Repeat twice in a week regularly to gain faster results. How long do I need to take this face pack for complete relief? This powder can provide great results in treating skin blemishes and acne within 4 months of use. But some may suffer with dull skin or acne due to severe reasons like genetics, in such cases use it for 6 months regularly. Fresh fruits and vegetables, high fibre foods, and plenty of water and fluid intake is recommended during course of treatment. Avoid junk, processed, preserved and oily foods. Consume foods which are light on stomach and avoid drinks like beverages, caffeinated drinks, tea and alcohol etc. Sleep for sufficient duration and perform regular exercises. You can send us your order and payment easily. Drop us a cheque or DD or transfer through NEFT. You can also deposit cash in our account or pay us on delivery in India. You will get your order in a pack which will conceal all the details and feature of the product. We value your privacy and hand-deliver right at your doorstep. Your order will reach within 3 to 5 working days anywhere in India through FedEx. I have been using this product from last year and believe me this product never gives any chance to complain. Everyone who uses it will feel fresh. Really a fantastic product which keeps our skin infection free!! This product is amazing. It gives you flawless glowing face. A must buy product!! I was suffering from acne problem since 1 year. After that I tried Chandra Prabha Ubtan. It works well for me. My acne marks are removed completely. Worth trying it!! This is by far one of the best and most natural of all skin nourishing creams I’ve come across. Loved it! Regular customer of this product!! Much better than any other fairness creams!! Chandra Prabha ubtan is really fragrant and high quality. It leaves my skin tone even and bright. I plan to buy it again. I purchased this pack after seeing all positive reviews and I must say it is amazing face pack. It has removed acne from my face and brighten my face remarkably. It protects my skin from acne and pimple problems. I have personally used this face pack before giving it to my daughters, as we don’t use any kind of cream or other facial packs. I found this pack very effective my face became very smooth and was looking clean and glowing naturally. Later I started telling my daughters too. Today they love this Chandra Prabha Ubtan. Thanks, Ayurvedic Herbal Face Pack for the valuable product.